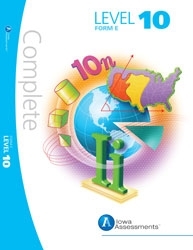 Iowa Assessment, Form E, is the latest edition of the Iowa tests that has been released for homeschooling families. (Publication date: 2012) Questions have been updated and much of the test has been aligned with the Common Core Curriculum. This should not be of concern to our homeschooling community because if you are using an academically solid curriculum, your student should score just fine. Since I do professional testing of homeschool students, I am seeing many of our homeschoolers scoring even higher than their counterparts in the public schools. Common Core is the curriculum that designates how teachers should get students through each grade level. The skills are basically the same, but there is a change on the emphasis of those skills. Common Core has put an even greater emphasis and focus on critical thinking as we prepare our students for higher studies and the technological world where they will work. There is an increased emphasis on understanding the underlying concepts in our academics. Good textbook companies and strong teachers do this anyway. This test will compare your students with other students who took this test in 2012, so the comparison is much more recent than any other testing available for homeschooling families.